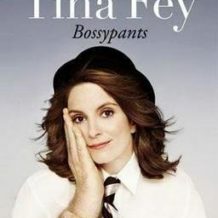 Bossypants, by Tina Fey. An autobiographical monologue by comedian Tina Fey that is pointed, professional, and hilarious. Made famous by her roles on “Saturday Night Live” and “30 Rock”, Fey traces her life from awkward adolescence to hard-won success in the male-dominated comedy field. More than a memoir, it is a spiky blend of humor, introspection, and critical thinking for a new generation. She is a strongly opinionated dynamo with a comedic voice that is totally her own. Bossypants is a delightful romp with one of the funniest and most original characters of our time. May 6, 2019. 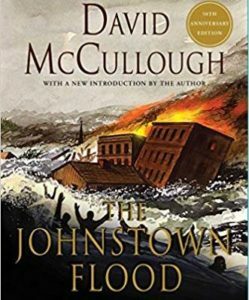 The Johnstown Flood, by David McCullough. In 1889, Johnstown, Pennsylvania, was a booming coal-and-steel town filled with hardworking families. Meanwhile, miles upstream an old earth dam had been hastily rebuilt to create a lake for an exclusive summer resort patronized by industry tycoons such as Carnegie, Frick, and Mellon. Despite repeated warnings, the dangers of the dam were ignored. On May 31, heavy rains burst the dam, sending a wall of water smashing through Johnstown, killing more than 2,000 people. The story of this epic historic disaster is told as a masterful thriller, revealing that those in positions of responsibility are not necessarily behaving responsibly. June 3, 2019. 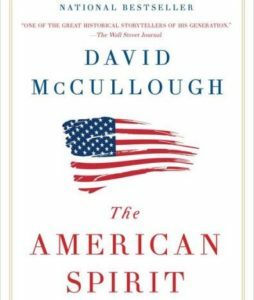 The American Spirit, by David McCullough. David McCullough is the most honored historian in the United States—winner of two Pulitzer Prizes, two National Book Awards, and the Presidential Medal of Freedom. He has collected some of his most important speeches in a brief volume designed to identify key principles and characteristics that are particularly American. The American Spirit reminds us of core American values to which we all subscribe, regardless of geographic region, political party, or ethnic background. This book reminds us who we are as Americans and helps to guide us as we find our way forward. Moke Hill Reads Book Club: First Tuesday of every month. No commitment, No attendance taken, No restrictions, No membership, No dues. For everyone interested in good books and discussions about them. Sponsored by the Mokelumne Hill Friends of the Library. Send your email address or watch for announcements on mokehill.org and other news sources. Contact Janet Dock: janetdock@me.com. You can get new posts from MokeHill.org delivered to your email Inbox. Subscribe today to get started. Copyright(c)2012, 2013 Mokelumne Hill Community Historical Trust. All Rights Reserved. | Site by Mary Wald.